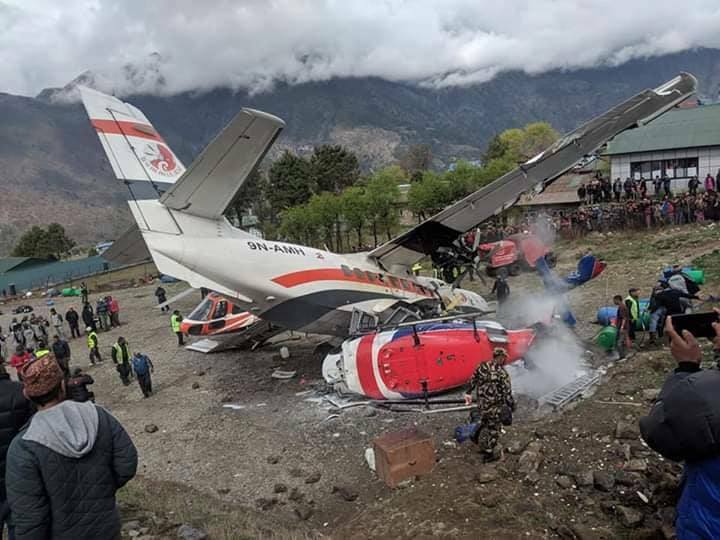 Solukhumbu–Two people were dead and another was injured when an aircraft of the Summit Air met with an accident at the Tenzing Hillary Airport in Lukla this morning. The deceased have been identified as co-pilot of the Summit Air S Dhungana and Assistant Sub-Inspector Ram Bahadur Khadka who was deployed at the Airport for security reason, according to the Civil Aviation Authority, Lukla In-Charge, Jhamanath Adhikari. Injured in the incident was security personnel Rudra Bahadur Shrestha. The accident occurred as the Summit Air (9N-AMH) that was about to take off from the airport to Ramechhap hit a parked helicopter at 9:20 am today as it skidded off the runway.